A few years ago I was in a store with another person when we ran into an acquaintance. The person I was with asked about the other woman's kids and she said that one of them was having trouble with some of the girls in her class. "Well," she said, "It's really only one girl. Everyone else just follows her." The person I was with, who also knew the class, said, "Let me guess," and said a name, which the mom confirmed was the right girl. That conversation has stuck with me all this time because it made me sad that this young girl had already developed such a negative reputation that her name was the first to come to mind. Proverbs 22:1 says, "A good name is more desirable than great riches; to be esteemed is better than silver or gold." Obviously, a good name isn't referring to how much we like the names we were given at birth, or how melodious they sound. It refers to how other people think of us, our reputations, how we are known by those who interact with us and by those who have only heard about us from others. What sort of person would people have to be talking about for our names to be the first to come to mind? None of us are perfect and we've all said or done things we regretted, but what is our overall reputation? This matters, not only for our own benefit and our own good name, but also for the benefit of the gospel. As Christians, we are ambassadors for Christ (2 Corinthians 5:20), which means that our names in our communities have an impact on His name in the community, too. How others view us because of our actions and our words will impact how they view Jesus. Isn't that a sobering thought? In our interactions with others, do they see His characteristics? Do they see His love, His compassion, His mercy and kindness, His patience and grace in the things we say and do? Or do they see our selfishness, our anger and our impatience and then equate that with the name of Jesus, whom we claim to serve? 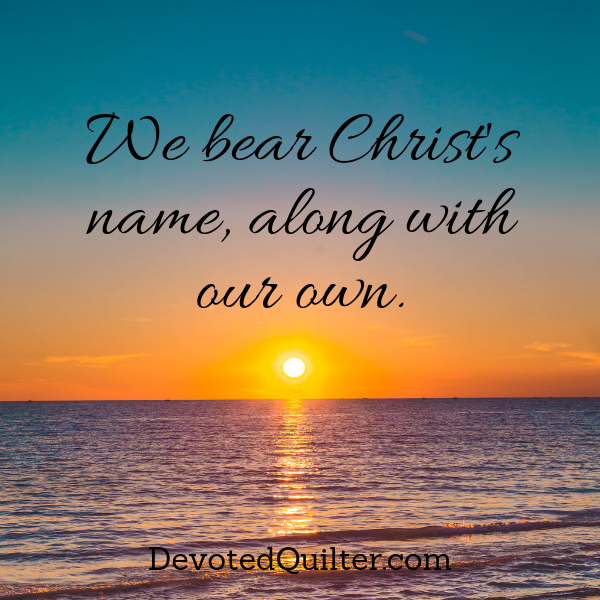 We bear Christ's name along with our own. Whatever our reputations may be, those who know we are Christians will link our names with His. Does that help His reputation in our communities or hinder it?